Time is suspended on sabbatical. Exploration and discovery replace the normal routines of life. I find it difficult to mark time, to remember that this new life is not my own but borrowed like a library book. I am renewed. Going on sabbatical is quite similar to creating a novel. I speak to strangers and walk down unknown lanes. The first days were intimidating. I felt lost, homesick and lonely. A year abroad seemed like a very long time, but there were benefits too. A sabbatical, free of life’s commitments, offered time to focus without distraction. I’m usually very involved in my community. On a different time zone, e-mails didn’t ping until the end of my workday. The phone rarely rang. No one passed by to chat. I could start fresh in a new setting. England was a year-long writer’s retreat. As I waited for my readers to comment on S.A.D., I set out to research NOT CRICKET (renamed A MATCH FOR EVE) and to gather material for my blog. The 2 book projects were perfect complements: one of introversion and revision and the other of extroversion and sensation. After counting down the months to weeks and now to days, nostalgia has overtaken my longing to return home. Reading a good book, you race through the pages, wanting to find out what will happen, only to realize that there are so few pages left. Do you slow down to savor every word? Reread favorite passages that you skimmed? I am in the final chapter of Oxford. Here are some earmarked pages, but to experience Oxford in its full complexity takes a sabbatical. It is a book in itself, the one I will write back in Maine. In the past couple of weeks my family came to visit in 4(!) lots. 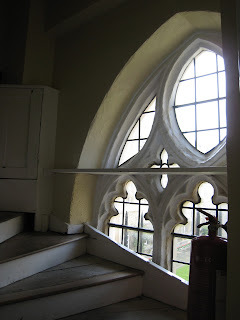 We showed them round the most beautifully grand colleges, Christ Church (above) and Magdalen College. We also visited my husband Henry’s alma mater, Oriel College (the window shots above.) 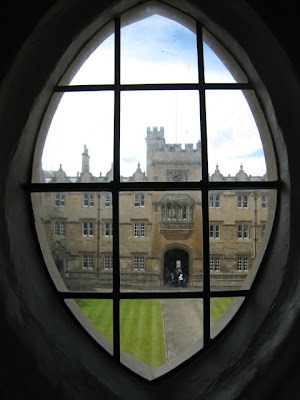 Another favorite was Merton College, which claims to be the oldest. Many colleges are open in the afternoon to visitors; some charge a fee. 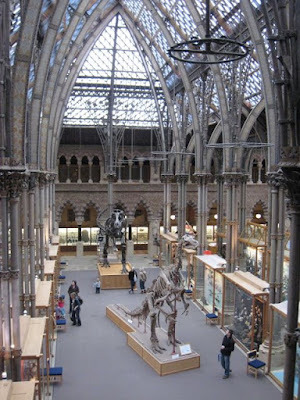 My two favorite Oxford museums are The Museum of Natural History (above) and The Museum of the History of Science. The first one is especially good for kids and features the Dodo bird from Alice and Wonderland. The Divinity School and Bodleian Library are definitely worth visiting too. Great for rainy days. When the sun shines, the Oxford waterways are a delight. 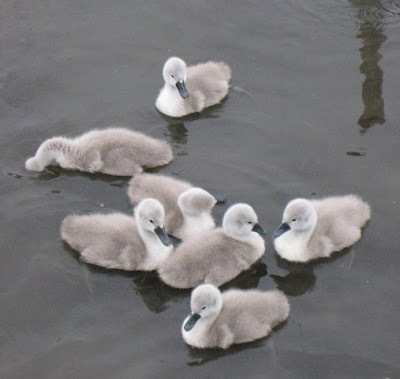 These cygnets hatched at the end of May. There are ducklings hatching now. The City of Oxford is situated between 2 rivers: the Cherwell and the Isis. The River Thames is called the Isis only when it runs through Oxford. The Celtic name for river is tamasas which became Tamasis in Latin. Say it aloud, and you’ll hear both Thames and Isis. The city’s name is less grand: it was where oxen could ford the rivers. 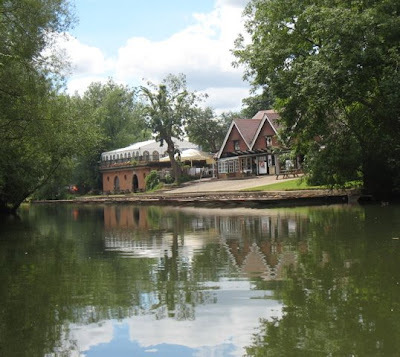 The ancient trading village predates the university, given its ideal setting on the rivers. In later centuries a canal was also dug stretching 78 miles from Oxford to Coventry. 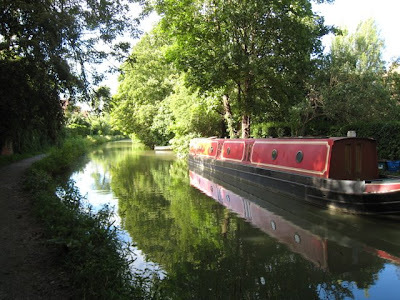 The Oxford Canal is a pleasant hour walk from Jericho to Wolvercote. You pass many funky canal boats and back gardens of posh North Oxford homes. The Burgess Field Nature Park is most peaceful, and if you get thirsty, you can cross the first bridge in Wolvercote to The Plough for a pint. Dogs are welcome outside. 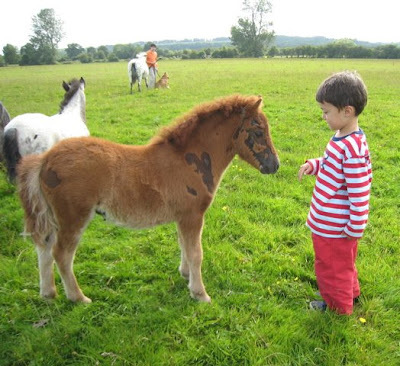 The best place for an off-lead (off-leash) dog walk is Port Meadow along the Isis, but you should hold onto your dog around the cattle and horses grazing free. 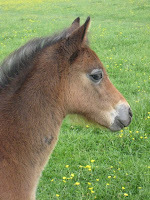 Several ponies have dropped foals recently. Since the mares know me from my daily walks, they let me and my visitors approach. In my teenaged years I was a bit of a horse whisperer. 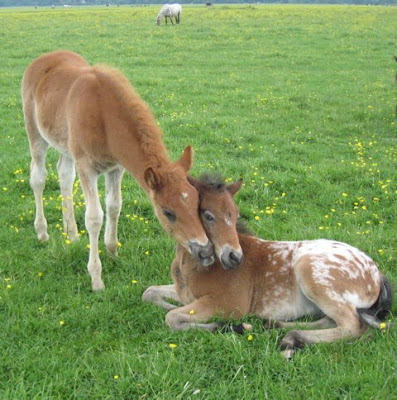 Whenever I’m feeling low, the foals cheer me up. They’re so friendly and funny. My kids and I take advantage of the long days of summer to visit the herd after dinner. 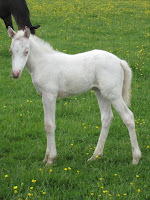 Our best buddy is a colt we call George (above and below) because he’s so curious. He likes to nibble on my son’s shoelaces. 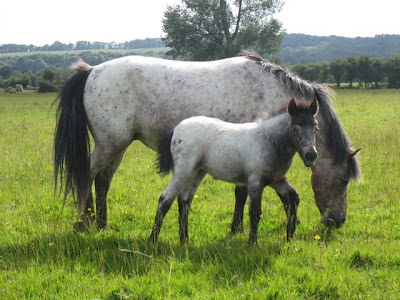 My daughter thinks the shy grey filly might be a unicorn. 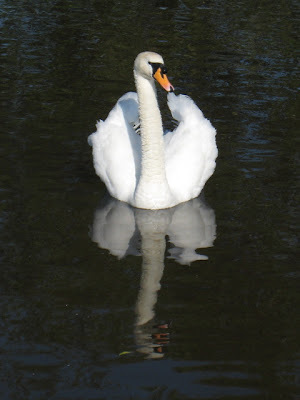 The swans are NOT friendly, but they are beautiful to watch. The best way to enjoy the water in Oxford is from a punt. You can rent them under the Magdalen Bridge or at the Cherwell Boathouse. We prefer the latter as it’s more rural, especially if you head upstream. Henry gave our 13-year-old son a punting lesson. Within minutes, he got the hang of it. Of course he’d love punting as it involves sticking a giant pole into the mud and pushing off. The skill is using the pole to steer like a rudder and letting go if it gets stuck so as not to fall in! Our son proved to be a natural like his old dad. I’m now slightly less nervous about him learning to drive in 2 years time. 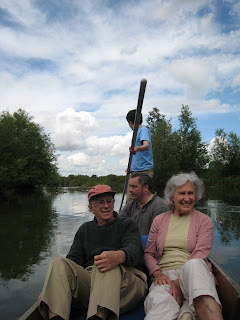 My parents were visiting from NYC and enjoyed their first punt. 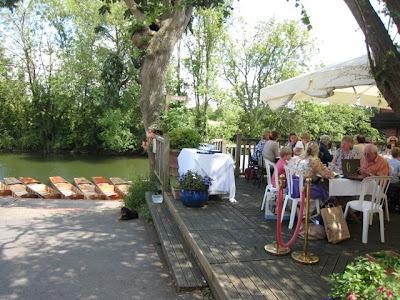 We had one of the best lunches I’ve had in Oxford at the Cherwell Boathouse. The food was gourmet and excellent value at only £12.50 for the 2 course set lunch menu on weekdays. The dockside setting couldn’t be better on a nice day. When it’s not raining, England is pleasantly 60’s or low 70’s at this time of year. You appreciate the sun that much more when it shines, and it's never too hot. The gardens thrive in this climate. Ideal boating weather. Despite my son’s facility, punting is not easy. We tried our best not to laugh watching these Spanish girls try to figure it out on their own. It was more like bumper cars as the punts bounced from bank to bank. 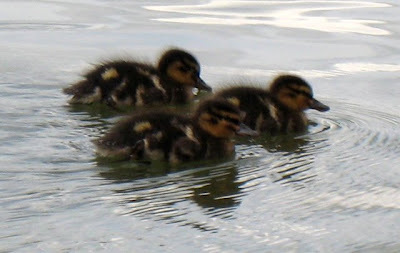 By the time our food came, the plucky girls had set off down river and had returned just as we were tucking into pudding. Book ahead to get a table but just show up for punting. 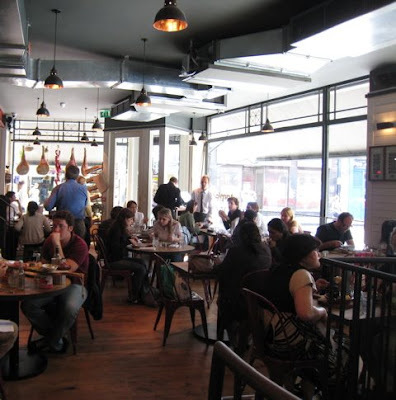 On a rainy day, you’d be better off having a gourmet lunch at Jamie’s Italian. It just opened in Oxford center. Usually I’d advise avoiding Italian food in the UK at all costs, but this is one of the rare exceptions. Jamie Oliver is a young celebrity chef and cookbook author. We enjoyed the ciabatta with its assortment of toppings even though they were served too cold and took forever to come. Henry’s lamb was excellent but the basil sauce was odd. My fresh-made pasta arrabiatta was excellent as were the homemade sorbets. The lunch menu was quite affordable. The only downside is they don’t accept reservations, and it was noisy. Jamie’s serves the best gourmet lunch option available in the heart of Oxford Center. For more casual recommendations read my Best Lunch and Tea in Oxford post. 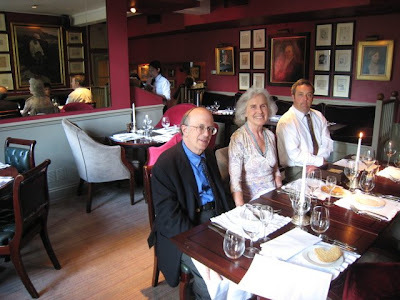 I’ve also reviewed some other restaurants in Fine Dining in Oxford. Since my parents were in town, we went to the two best gourmet restaurants in Oxford. The Old Parsonage and Gee’s are under the same ownership, but are quite different in feel. The best dinner I’ve had in Oxford was at The Old Parsonage, and it was so good that we are going back on Friday for our last meal here. The setting is charmingly Old World without being stuffy. The marinated tuna sashimi was sublime and the duck delicious. Everything we ordered was excellent as was the service. It a short walk up Banburry Road away from the City Center. The food was not as good at Gee’s, but perhaps that is my taste as it is more traditionally English. The ingredients were fresh and local when possible. We had an excellent turkey dinner around Christmas that couldn’t have been better, but the two other times we dined there were not as good. Still, my family was happy with our meals, and we are picky eaters when it comes to quality dining, especially at that price. The only disappointing dish was the lobster risotto – remember the avoid Italian food in England rule? We'll have the best lobster back home in Maine anyway. 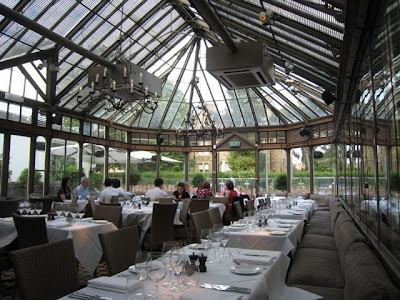 The Victorian glass conservatory setting at Gee’s is just lovely and quite unique. It’s worth going for the atmosphere and top quality service for a special date. The ambiance, however, was ruined by the live jazz music on Sunday nights. It was so loud that we couldn’t talk. And there was so much to say about how much I’ve loved this sabbatical in Oxford. It's going to be very hard to leave in 4 days. Still I’m eager to head home to be closer to family and friends. Tomorrow I’m meeting a friend from home, Scott Sehon, for a pint and dinner. These visitors help ease the transition. It was hard to say goodbye to my English friends, though. I’m an emotional yoyo about leaving. All the work of packing is ahead of me in these next few days. Even the weather is reflecting my mood. Yesterday I got soaked in a downpour, and then it hailed so hard I couldn’t see out the window. A rainbow appeared for only minutes. A gazillion frog babies are hopping down the sidewalk and through our garden to Port Meadow. 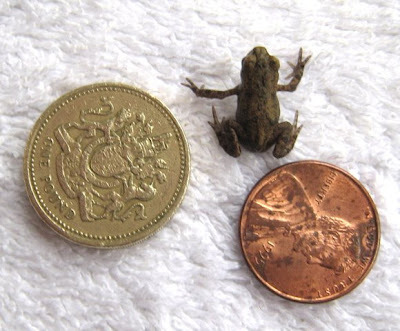 That’s an English pound coin and an American penny by the frog for cross-cultural size reference. I’m not sticking around for the plague of locusts. We’re not going directly home but spending a night with Henry’s family and then with friends in Cambridge, UK. Henry is flying with our dog to Boston and then driving to Maine. The kids and I are flying via NYC to catch up with family and friends. Next week I plan to blog from Manhattan on Thursday. Any tips, world travelers, on adjusting back to life in the USA? How's Maine? Yes, the blog will continue on my usual Wednesdays in Maine. It’s a special place too if very different. As much as I enjoyed Oxford, I love my home most of all. Stay tuned to find out why. You've closed out your Oxford year with such a great post! I particularly love your first paragraph: it really sets the tone, and I like the neat double meaning of "renewed." So many beautiful pictures -- and such great suggestions for places to eat! I hope to explore more of Oxford in the next year . . . to retrace your steps. I will be in New York next week, too -- but Saratoga, not NYC. As much as I can enjoy the temperate English climate, I AM looking forward to what I think of as proper summer. I will be thinking of you so much in the next week . . . good luck with packing, and travelling, and your "next chapter." How poignant and well said. It is sad to leave Europe behind and the way you talked about your sabbatical was very descriptive and full of emotions. Have a great trip back to home, because no matter how great Europe is, it is not home. Bee, how funny that our paths might cross again. We’re flying into JFK Monday afternoon. It would be fun to see you in the airport! Thanks for your well wishes and have a nice trip yourself. Tina, it will be nice to go home, but England will always be a second home. I just read your comment on an earlier post. What an amazing coincidence that you went to the Longfellow School in Brunswick! Both of my children attended that elementary school too. We will be sad to see it shut. Sarah, what a beautiful farewell love letter. I confess I had a bit of a lump in my throat thinking about being in your shoes in a couple of years. Wishing you well as you finish up these last few days in England and looking forward to hearing about your transition back. I LOVED this post. I love how you compared your time there to a book from a library. Very well said. I'm not sure how Maine is doing at the moment, but it can't be too different from Connecticut (perhaps a little colder), and we are in the 90s this week with humidity. One of those lovely heat waves! JAPRA, these are teary days of hard goodbyes. Thanks for your good wishes. Alyson, thank you. I do spend a lot of time thinking about books. It figures I’d go from too cool to too hot. Good to have the warning as I’m packing. You have such a gift for expressing your emotions. What a wonderful post. You can tell that you really treasure your memories but also that you will enjoy returning to your life at home. I hope you and your family have an uneventful trip back to the USA and enjoy your travels until you make it back home to Maine. I really look forward to your blogging from Maine. Sarah, your posting from Oxford has been very enjoyable - although I've never been to Oxford i would very much like to go there now (having read your blog). I would like to learn to punt (like your son) and I would like to see the old colleges and universities. I'm glad you'll continue your blog from Maine - and I'm looking forward to reading your boks (when they're available). What a beautiful place! I have wanted to escape for a year at times. You actually did it! Bittersweet and the good with the bad but oh, you are a different person for it don't you think? Such a pretty blog! I'm glad we found you! Cindy, thank you – this year is a full treasure box of memories. I’m so glad you’ll be with me back in the USA too. Katarina, it’s so encouraging to hear that I have readers even before the books are done. You keep me going with a big smile. Layanee, that’s an interesting question. I’ve lived in England about 3 years total over the past couple decades. The first time definitely changed me, but now living in both countries seems to be part of who I am, especially since my husband is English. Living abroad is indeed a transformative experience. I hope you get the opportunity too. Welcome Pamela and thank you! I enjoyed visiting your blog too. What a thoughtfully-written and beautiful post. Oxford looks so enchanting through your eyes ... I liked your comparison of your sabbatical to a good library book. You'll have such good memories of your time in Oxford as will your family. 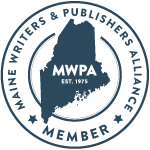 I am looking forward to reading about your life in Maine - as seen through your amazing writing and photographs. I loved that post. It makes me nostalgic and I'm not even leaving. Now, stop blogging, and get packing. You are either the most relaxed, laid back person I've ever enountered or you are in deep, deep denial. One more thing re: NOT CRICKET. My husband came home last night from playing Cricket in Oxford of all places. Having no one else to talk about the game with but me, he completely choose to ignore my disinterest and went into great detail about his triumph. The conversation went something like this: We had to retire any batter over 25 runs and I was the last and had to be retired and we won in four overs." Out of love for my husband, I smiled and nodded in interest. It reminded me of the New Yorker cartoon from years ago where a woman is talking to her dog "now, fido, you're a good boy aren't you? you're a very good boy." And the next caption is What the dog hears: "fido blah blah blah fido." I'm the dog. My point being, I do hope NOT CRICKET is well, not about cricket! Audrey, you make me laugh. I really needed that today as the rain hasn’t stopped, and I still have more empty suitcases than full ones. I wonder why? I wish I were relaxed but self-delusion is far more accurate. I’ve been trying to train my dog to pack, but all she does is hide socks and crawl into suitcases looking miserable. As for my novel, rest assured, it is NOT Cricket. I love that English expression of not playing by the rules of gentlemanly conduct. You’ll get cricket whites, a cute bowler, champagne and strawberries but not much more. Can I toss in a googly? I do empathize with you as my husband is a cricket fan. Our daughter has proven to be quite the cricket ace at school. I’d recommend a good short book on cricket terms written for wives and/or Americans only I’ve already packed it! Congratulations to your husband and to you for being such a supportive spouse. Kate, thank you! I’ll try to do my best by Maine too. I’m so lucky to get to live in such inspiring, photogenic locations. Although Audrey is right. I'll never get there if I don't get back to packing. My blog posts and comments get longer when I'm not actively working on a novel because I miss writing. 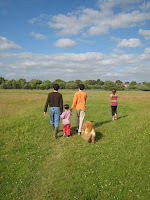 I have just recommended your blog to an American friend who loves Oxford. A super way to cyber visit with you as a most wonderful tour guide. Good luck with the move and hoping to catch up with you in the US when you are settled. Oh how I love your photos of churches and animals. You may be a good writer, but I'd bet your more talented as a photographer. You definitely have have an eye for capturing the emotion of the moment. Keep up the good work. Elizabeth, thanks for the referral. I’m sure I’ll revisit Oxford occasionally in future posts as I work on my novel. Archives are great. Your Moroccan archive must be a big help/comfort to you too in NYC. I’ll be in touch once things settle down back home. @ENPF, thanks! The best thing is I don’t have to choose between writing and art. I paint outside during the summers and write novels during the rest of the year. My camera comes everywhere with me. I enjoy how my two creative passions come together in my blog. Thank you for the virtual tour. 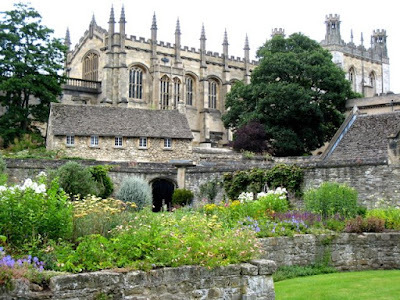 Although I am not well travelled, I have been to Oxford as part of a horti-centric tour of England. I am an anglophile, and my brief time in Oxford is a strong memory. I am jealous of your time there. Good luck with your transition, safe travels and thanks again. Beyond a point I wonder if it is indeed possible to leave, more so when the treasure chest of memories is full, returning one to the place long after one has left it! Like always I enjoyed reading this post, and even as I'll look forward to your posts from Maine I do hope you'll return every once in a while to reminisce about your Oxford stay. Welcome Les! A horti-centric tour sounds like a lovely way to see England. Thanks for your well wishes. I'm now just about ready for the shippers coming tomorrow morning for the books and winter (ha!) clothes. Anil, I will reminisce about Oxford as I work on NOT CRICKET. There’s a cricket post in the works for sure. The appeal for me of cricket is it is so English and yet has almost universal appeal, with the exception of Americans. Why? These subtle differences between cultures fascinate me. Hope you had a good trip home. I know that it must be hard to transition your life again, but I'm sure it will all be worth it. The adventures that your children, you and your husband have are priceless. Can't wait for your new book! Hope you're enjoying Maine again and are re-adjusting well! I'm sure you'll miss Oxford but nothing will take your memories away from you! Thanks, Richard. Our time in Oxford sure went quickly, didn’t it? Kelly, thanks for your kind words and enthusiasm for the new book. Now all I need to do is write it!